Professional Magicians: Can Guests Film Video of Magicians at Events? Can Guests Film Video of Magicians at Events? We received a short video filmed by one of the guests at a recent event. The company booked Michael Fairall to perform close up magic for guests at their tables. 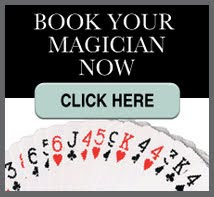 It's a short little video, but nicely demonstrates the entertainment value good close up magic provides. Guests often ask to film the magic when our magicians visit their tables. We encourage that to happen. The guests are having a great time and want to share the experience with their friends, work colleagues and family. That shows they loved the experience, but also means it's something they want to share! Our clients love their guests talking about the amazing time they had at the event. A video from their event, going viral is unbeatable publicity!